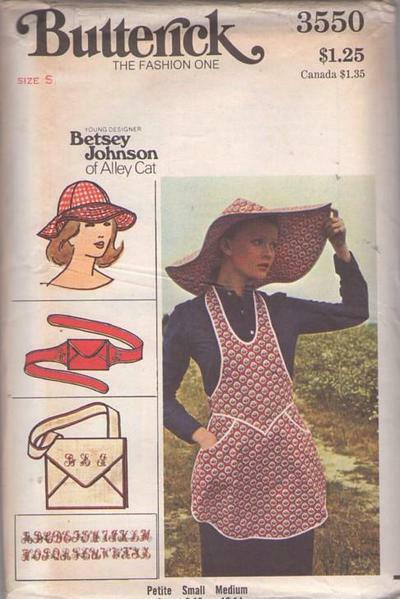 70s Designer, Retro Accessory Clothing Patterns - MISSES' APRON, HATS, BAG & BELT - Betsey Johnson. Hat "one size fits all" has four-piece crown and wide or very wide topstitched brim. Close-fitting wrap and tie apron has shaped front waistline seam and slanted pockets. Envelope belt purse has attached self ties. Envelope shoulder bag with gussets has attached self strap. Purchased bias foldover tape finish. (Transfers and instructions included for embroidery on apron, purse and bag.